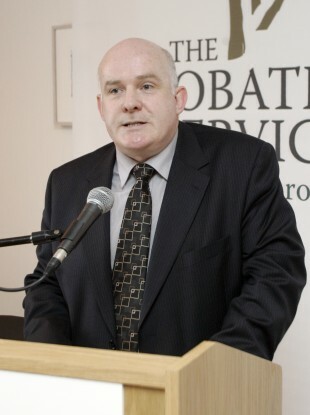 Michael Donnellan, Director General of the Irish Prison Service. THE DIRECTOR GENERAL of the Irish Prison Service has said that there are 19 prisoners currently “unlawfully at large” – including one who has been on the run since 1995. Michael Donnellan, who took up the top post at the Prison Service late last year, was speaking in front of the Joint Oireachtas Commitee on Justice, Defence and Equality this morning. He was called, along with two colleagues, to discuss the procedure for transferring prisoners following the escape from minimum-security Loughan House prison of Martin McDermott, a man serving a seven-year sentence for the manslaughter of Garda Gary McLoughlin in Donegal in 2009. Just this morning it emerged that this wasn’t the first time McDermott had absconded from Loughan House. He had previously escaped for six days in 2007 when in custody there for a different offence. McDermott is now back in custody after being jailed in Derry again last Friday. The debacle saw the Prison Service appearance before the Oireachtas committee this morning scheduled in at the last minute. Michael Donnellan said that the Irish Prison Service “apologises completely and unreservedly for what has happened”. He said that only 6 per cent of the prison population of Ireland – that’s around 220 out of 4,000 inmates – was housed in open centres. There are no open centres for women or people under the age of 21. However, there are currently 19 people on the run from open centres – which have minimum security – around the country. None of these escapees, he added, were in custody for killing a person. We would have people unlawfully at large since 1995. One or two people. The head of the Garda Representative Association criticised the decision to move McDermott to low-security Loughan House after it was known that he had escaped from there on a previous occasion. Damien McCarthy called the move “astonishing”. Email “Prisoner has been on the run since 1995”. Feedback on “Prisoner has been on the run since 1995”.